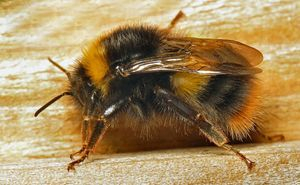 You may see large Bumble bees between April/May. These are new queens that have come out of hibernation and are looking for somewhere to lay their eggs.Once they have found somewhere and have produced enough off spring they will not come out again. They remain in their area for around 6 months then die off. The larger ones you see flying during the summer are the first born, which become guard bees. 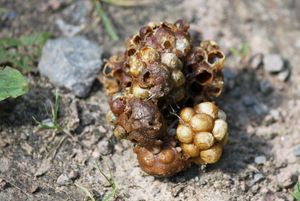 They don't make a nest as such, just lay a cluster of eggs (see picture below). Best thing to do is leave alone and let nature take its course. The complete colony dies out Sept/Oct. they will not swarm like Honey Bees or attack like wasps. if you leave them alone they will leave you alone, as they have such a short lifespan. If they do become a problem we can remove and relocate the colony for a fee. If they are in a cavity wall, nothing you can do until they die out and then get the hole sealed, before the following season.